Highlight of the Saturday card at Auteuil is the G.3 Prix Montgomery chase which has drawn a baker’s dozen of runners for the 4700m (2m7½f), €175,000 event. 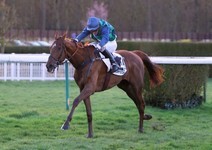 An excellent reference is last month’s Prix Violin II in which six of this weekend’s runners participated. François Cottin’s Cafertiti, who finished second that day, is expected to give another competitive account even though he has never been tested beyond 4400m. A length behind him on that occasion, Saint Xavier showed marked improvement after a string of modest performances in the provinces, but there is considerable attention being paid to Decret who was by no means disgraced when fourth three weeks ago following his 3½ months’ break. Trainer François Nicolle is confident of his 5 year-old’s chances, acknowledging that both the distance and going should suit him well. Others of interest include 2016 Prix du Président winner, Kelthomas, and the consistent Vic Royal, who finished fifth in the race of reference. Dominique Bressou, whose stable has been firing on all cylinders recently, sends out Celtino who made a very good re-entry in the Grand Steeple de Craon and the handler anticipates a big run despite the drying conditions.